Science fiction writers have long imagined a future for humanson Mars, and Hollywood has created several movie fantasies about what theexperience could be like (with a few improbable aliens added for extra drama). ?NASA has addressed the possibility of creating human colonies on Mars someday,but so far, only robots have stepped foot on the red soil.? How long will we have to wait for science fiction to becomea reality?? According to Charles Cockell, a microbiologist at the OpenUniversity in the UK, humanscould go to Mars now. ?Technically, we could go today if we wanted to,? he says,and suggests the reason humans haven?t madethe journey yet is because of political concerns.? ?I think we are ready. ?As time goes on, we?re going to be more and more ready to go as technology getsbetter and lifesupport systems improve.?? Mars has a thinner atmosphere than Earth, so the surface ismore exposed to the sun?s radiation and cosmic radiation from the galaxy. ?Cockell says human travelers to Mars would have an increased risk of cancer dueto this exposure, and also because of the long, 6-month journey out, sincespacecraft don?t adequately shield astronauts from radiation.? However, he saysthat we could devise shelters to help mitigate this danger. ?You could get people there and back alive with a smallstorm shelter on the spaceship,? he says.? ?It?s not that bad ? you sit in abox for a couple of days during a solar particle storm.? The habitatfor Mars explorers will be an 8-meter diameter tin can anyway.?? The first habitat on Mars will be small, but the firstexplorers will probably only stay for 500 days before heading back to Earth. 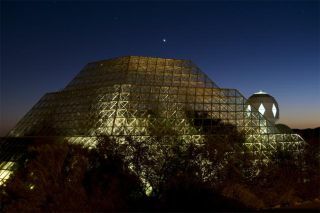 ?Long-term plans for more extensive habitats on Mars are similar to theBiosphere 2 project: a completely contained, closed-loop shelter that hasgardens for growing food, recycled water, and other natural systems that useinternal resources to support the humans living there.? Many scientists are concerned that even with a closedsystem, a human colony on Mars creates planetary protection problems.? Astrobiologistshope to find proof of native life on Mars, and because humans carry with thembillions of bacteria, we could end up introducing Earth-life on Mars andcorrupting or extinguishing any life that may reside there. While Cockell agrees we do need to search for indigenouslife on Mars, he doesn?t think these planetary protection issues are a majorconcern.? ?Human microbes are not going to survive for very long onMars anyway ? they?ll die very quickly,? he says.? ?Not a lot of people wouldagree with my views, but I would just go there and be done with it.? It?s notlikely that, even if a microbe did grow, it?s going to destroy life on aplanetary scale.? Most scientists think life on Mars would have to be deepunderground in order to access the subterranean water and to stay protectedfrom the harsh surface environment.? Cockell says this means we have even lessto worry about in regards to contaminating Mars. ?On Earth, when you go out to do your shopping, you don?tworry about contaminating the deep subsurface biosphere 3 kilometers underneaththe store,? he notes.? ?That?s my parallel with Mars. We?ve blown up a concernthat isn?t really a concern.? ?Even if there is indigenous life, the chance of anythingcoming off humans or off equipment that?s going to cause planetary scaledisruption in the martian biota by finding its way into the subsurface is soremote, it?s not even worth worrying about,? he adds.? Cockell says that, to be prudent, we should try to limit themicrobes we bring to Mars, and also catalogue the microbes we know we aretaking with us.? Still, he doesn?t think too much money or effort should bededicated to this aspect of exploring Mars.? One exception would be if wedrilled deep into the martian subsurface.? ?Then we would have to be more careful,? he says.? ?Butgenerally I think we can easily do human exploration on the surface withoutcausing a catastrophe to martian biology.? Of course this is all purespeculation, because we don?t know what martian biology would be like, if it?sthere at all.? Cockell?s enthusiasm to send humans to Mars is part of apersonal dream to go there himself.? In fact, he says he would love to be thefirst person to cross the martian north pole. He has been to the Earth?s SouthPole, traveling with the British Antarctic Survey to study the effects of UVradiation on microorganisms? ?I guess that?s one of the reasons I do studies in extremeenvironments, because it gives me a connection with Mars,? he says.? In that light, Cockell helped create the Earth and SpaceFoundation, which funds expeditions that bridge the gap between Earth and spaceexploration.? In addition to funding field work in extreme environments onEarth, the foundation has set up awards for future expeditions on Mars,including one for the first team to reach the summit of Olympus Mons, thelargest volcano in the solar system. ?For the summit of Olympus award, we have a piece of rockfrom the summit of Mount Everest and a plaque,? he says.? ?We also put $10,000into a high interest account, and the money will just sit there.? In a hundredyears time, when someone comes to claim it, the award will be substantial.? ?